What is your what-, how-, why-perspective? Do you tend to focus on your todo-list and on how to get the items on it done asap? Or do You like it more to philosophise about what things You could do to reach your ideal, and are you less interested in how exacly to get there? 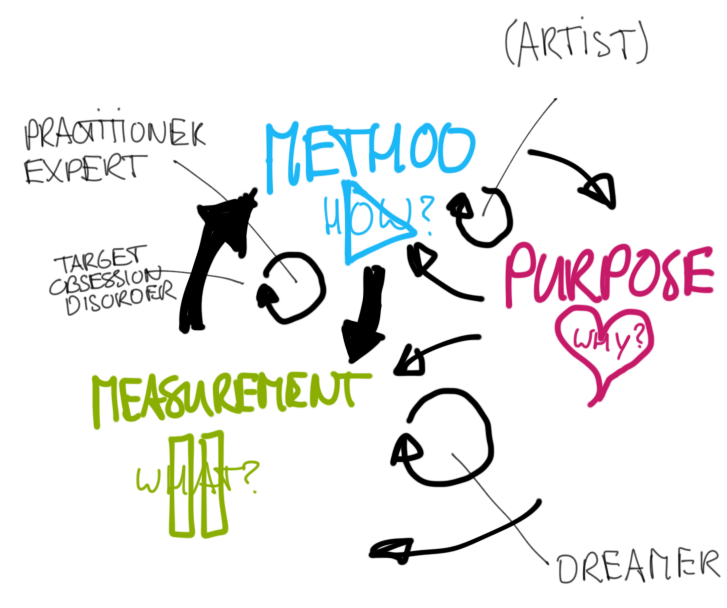 As an experiment (like all the other stuff in this blog), I’ve taken the what-, how- and why-questions (See post “The dubio formula”) and looked for some different ‘dubio-perspectives’. What-how perspective (manager/expert) Do I like to focus on what needs to be done, and how it can be done? Take the example of a manager, steering a group of experts (how) towards completing a set of deliverables (what), or -other way around- an expert optimising her/his method (how) to a certain target (what). Why-what perspective (dreamer) Or do I like to think about what can be done (what) to reach a certain dream, or vision (why)? Do I need to have a purpose for everything that is on my todo list, otherwise I cannot be motivated? Is it easy to make plans, but difficult to get things done? How-why perspective (artist) Do I prefer to get busy with doing what I’m good at because I like it and/or I feel an trust it will get me to the point where I want to be eventually? Like an artist who likes creating a beautiful piece of art, but feels it is inappropriate or impossible to envision a piece of art in his/her head, and then to reverse-engineer it. You could argue that a there are also ‘lone’ perspectives only focusing on one of the three, and one focusing on all. Q: Dear reader (hehe…if any), what do you think of this? Do you recognise yourself in one of the perspectives in particular? I’m a little lost on the “artist” perspective – but I see the expert and dreamer as being interchangeable. The dreamer creates the big idea, the expert sets about on how to accomplish it and what is needed to reach ‘expertise’ level. According to Daniel Pink – we all want Autonomy, Mastery and Purpose. To control our tasks and figure out the best way to do it, to be challenged enough that we strive to get better and become an expert, and then to realize something greater with purpose. I know that’s certain an ideal that I strive for. I understand that you’re lost in the “artist” perspective, it’s the most tricky one. The reason I call it “artist perspective” is that -although there are probably other professions (or passions) that people focus on a combination of why and how- an artist is the clearest example for me. If you argue that successful artists are generally very passionate about what they do (why), and very skilled at a certain technique (how), that explains the focus on why and how. Why I think thy skip ‘the what’ is because -arguably- a piece of art cannot be planned. It cannot be reverse-engineered and repeated. I feel the value of a painting lies in the beauty, the emotional response it generates, and -interestingly- also the history of it, like the proces of making it. Artists might even feel aversion to planning a piece of art, starting with the end product in mind and reasoning back about how to get there. Well… judging by the amount of words I need to explain my idea on this, I guess I haven’t cristallised it myself, but I would be interested to hear from you if you see where I’m going with this. Again, this post is just a thought-experiment. I like your reference to Daniel Pink very much. (You might know I posted about him before, see https://dubioblog.wordpress.com/2011/12/24/why-do-i-do-it-motivation/). I believe (and I started writing a post about it) that Pink’s autonomy, competence, and purpose align well with respectively the what (choices, decisions, plans), the how (skills, methods, techniques) and the why (motives, values, passions, purpose). I’m writing ahead, so I will propably post about this topic in a week’s time. Again, I would be very interested to hear your take on this! STANCE: Mantra that is deeply engraved and influences our actions. Actions of someone who sees the world as unchangeable and the self as a small cog in a giant machine are very different from the actions of an open and optimistic designer. – Stance GUIDES which Tools we choose to accumulate. TOOLS: What we use to organize our thinking & understand our world. These range from strict analytical frameworks to rule of thumbs. If you are interested in websites design – you go to school to get a degree in it. – Experiences are a PRODUCT Stance and Tools. EXPERIENCES: Formed by our most practical and tangible knowledge. We are guided towards some experiences, and away from others. — Sensitivity is capacity to make distinction between conditions that are similar but not exactly the same. A chef can make a distinction between meat that is done, and not quite done. — Skills are the capacity to carry out an activity to consistently produce desired result. A skilled chef can consistently cook a steak to the desired cookness. — Sensitivity and Skills grow and deepen together. As you repeat a task, you learn from repetition and develop a consistent technique. Improved techniques sharpen your skills, making you faster and more accurate. STANCE guides TOOLS, which guides accumulation of EXPERIENCES. EXPERIENCES inform acquisition of more TOOLS, which add depth and clarity to STANCE. Correct me if I’m wrong, but I think this does a good job of summarizing your thought-experiment. Thanks for that! I will try to overcome the ‘not invented here syndrome’ that I always have with other people’s models (just kidding…. I think) and see what the value of it is for me. At first glance, I definitely see links with my thought experiment (I can feel a 2.0 version of my post coming). Thanks again for sharing!